About the product: For an adventurous flying experience the UDIU818A is the best option, that captures best aerial photography and videography. Product Features: First Person View with VR Headset Compatibility delivers live video feed from the users’ mobile device as it comes with the all new FPV Wi-Fi feature. Moreover, it easily syncs with the VR headset to the controller, to make the flying experience more lively. The Headless Mode system allows an intelligent orientation and eliminates the need for regulating the drone. Its Return Home Function sees to the fact that the aircraft is not lost and brings the drone back with just a simple push of the button. 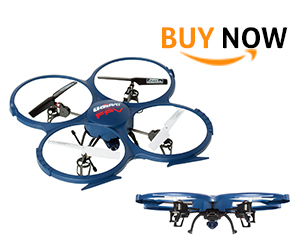 The 6 Axis Gyro Stability provides with a multi-axis gyro and offers extra stability for easy handling and 360* flips. The 2MP HD Camera captures great HD aerial footage and photos. It also has 2 LiPo batteries and a Bonus Power Bank. 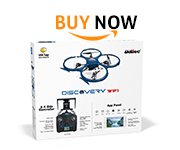 This drone is the latest UDI 818A Wi-fi FPV drone exclusively through USA Toyz updated with Wi-Fi and FPV or first-person view. One can pair the drone and mobile device easily through iOS and Android systems. It can be easily synced with a controller with all of the latest features by simply updating the app in the app store. Also, it can be synced with any compatible VR headset with the controller along with the latest app update to bring life to the flight of the drone. One can enjoy watching live videos and photo feeds through any compatible device while in flight. The gravity induction mode allows the drone to fly on its own and one does not need to operate the mobile device. As they say, it is ‘Ready to fly right out of the box’. The four safety guard-protected propellers prevent collision and damage as well as are impact-resistant. The plastic parts are durable and are easy to repair. It also includes a bonus battery thus doubling the flying time. It can be swapped or charged in place easily by means of a USB. The charge lasts 6-9 minutes per flight. A 2MP Forward-facing camera takes great HD video and HD photos with intense color and great white balance. The video resolution has been upgraded to 1280*720 at 30 FPS. It also has a removable Micro-SD (TF). AVI and JPEG format videos are easy to upload. The Photo button on the controller takes pictures. The video button starts and stops recording and the roll button does an instant 360° flip. The Left and right trigger joystick combo make the drone flip 360° in any direction. The LED running lights and remote control signal light helps in night-time flights. The Final Verdict: Best for outdoor activities and travels. Worth the price for beginners!